Please read the following call to geographers sent from our colleagues in Wallmapu, Mapuche territories in the South of Chile. On November 14th in the Mapuche community of Temucuicui Traditional, Camilo Catrillanca was shot in the head during a raid on the Community by the “antiterrorist” special branch of the Chilean police, the “Jungle Command”, which was launched four months ago by President Sebastian Piñera and trained in the USA and Colombia in anti-terrorist action. The invasion of Mapuche land by nearly 400 policemen and helicopters led to the death of lamngen Camilo Catrillanca and the injury of a minor who was with him as he was travelling home from work on his tractor. Camilo Catrillanca was not taken to hospital and subsequently died from his injuries. Footage of the incident recorded by the police has been deleted and Mapuche peoples are calling for an investigation into the death. 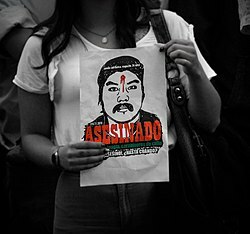 This death occurs just a year after lamngen Rafael Nahuel was shot in the back in Argentina as he ran from police and is one in a long line of the deaths of indigenous activists in Chile who are fighting for territorial and cultural rights. Below, Viviana outlines the outstanding debts geographers have to indigenous communities and the responsibility we now have to those communities. She outlines how we must move from a geopolitics of death to a geography of life. Please engage and respond to this call if you feel necessary, let us know if you would like your name added to the list.